Spring starts tomorrow and I am so excited to share our SPRING PRESCHOOL MATH AND LITERACY PACK. These are designed for preschoolers, kindergarteners, and kids ages from 3 to 6 years old. The pack contains 30 activities and it includes activities for improving fine motor skills, color matching, learning numbers, letters, phonics, and much much more! To give you an idea what you will be getting in this learning material check out the previews below for details. Learning about flowers is a must have in all spring activities! This is the time where we see colors and life after months of cold and dark winter. My kids love identifying and naming the flowers as we see them around in our place so I added these 3 part cards of beautiful hand-painted spring flowers in our learning pack for kids to enjoy! They're just so beautiful and definitely a favorite activity in our printable bundle. This is an extension work of spring flowers. Just like in our Autumn Leaf Silhouette activity (Fall Autumn Preschool and Kindergarten Learning Materials), I also made a similar one for our spring preschool unit but this time around instead of leaf shapes we're doing flowers. I was surprised that this learning activity was a bit challenging for Vito. But he loves challenges so he truly enjoyed this one. I love how this activity turned out! Vito was so engaged in this one. He practically sat there quietly, counting, and observing the cards then sorting them out. Once assembled, the rainbow colored cards are so gorgeous. These look like watercolor rainbows with numbers! You'll definitely want this in your classroom and home school. Such a beautiful material to learn about different number representations and can go along with any season too! Because spring brings about life and kids love animals, I decided to add these cuties in the learning bundle pack. I got the idea from the book "Are You My Mother? ", which Vito loves. We used glass gems to match the baby animals instead of pegs. You can use any manipulatives available for this activity. Because we see tulips always lined up on the side of the road (and daffodils too), here's a beautiful measuring activity of tulips flower beds. Use 2-cm snapcubes on this one as unit of measure and let the child measure the length of the flowerbeds. Mostly, Vito would look at the cards, and then "estimate" the number of snapcubes that would measure up the flowerbed. If your child is like this as well, don't stop them from estimating. It's the best opportunity for you to teach them to compare estimated guess and the actual length of things. This learning activity teaches the child to identify patterns by recreating the color pattern of birds using manipulatives. There's also a set included in the learning pack where the child can fill-up and continue the pattern. So the printable will definitely grow with your child. It adds up challenging activities as your child progresses. We also have learning activities for kids who are obsessed with playdoughs. Here's a learning activity about shapes while playing and molding playdoughs! 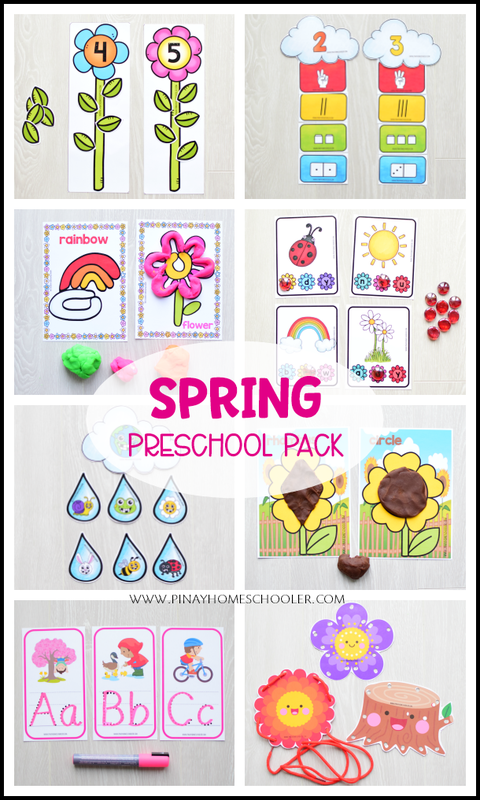 I received a lot of feedbacks from our Fall / Autumn Preschool Unit Pack that they love our lacing cards so I added spring lacing cards in our Spring Preschool Unit Pack too! Of course we have ten frames counting clipcards for those who are still learning and loves to count. This set is counting from 1 to 20. Beginning letter sound from A to Z sorting activities. The child will name the pictures in the flowers and identify their beginning sound. Then he/she will sort the flowers according to the lettered-pot they belong to. This one is really fun to do specially as a group activity! If you are working with a group of kids, you can set up a game of taking turns. They will truly enjoy this activity! Or if you are a homeschooler, you can just work with two or three letters at a time so as not to overwhelm the child. I love adding fun games in our preschool unit learning packs and this sorting activity of spring character faces is one of them. I designed it to form a rain cloud and each cloud has about 6 raindrop matching faces. And the last preview of this learning material is about these beautiful uppercase and lowercase letter clipcards. This is actually one of my favorite in the pack and it took me awhile to finish. Your kids will absolutely love this one. You can work on these cards all year round and not just in springtime. So these are just some of the activities that are included in our SPRING PRESCHOOL UNIT LEARNING PACK. There are 30 activities in the pack, complete with math and literacy plus fine motor skills activities. 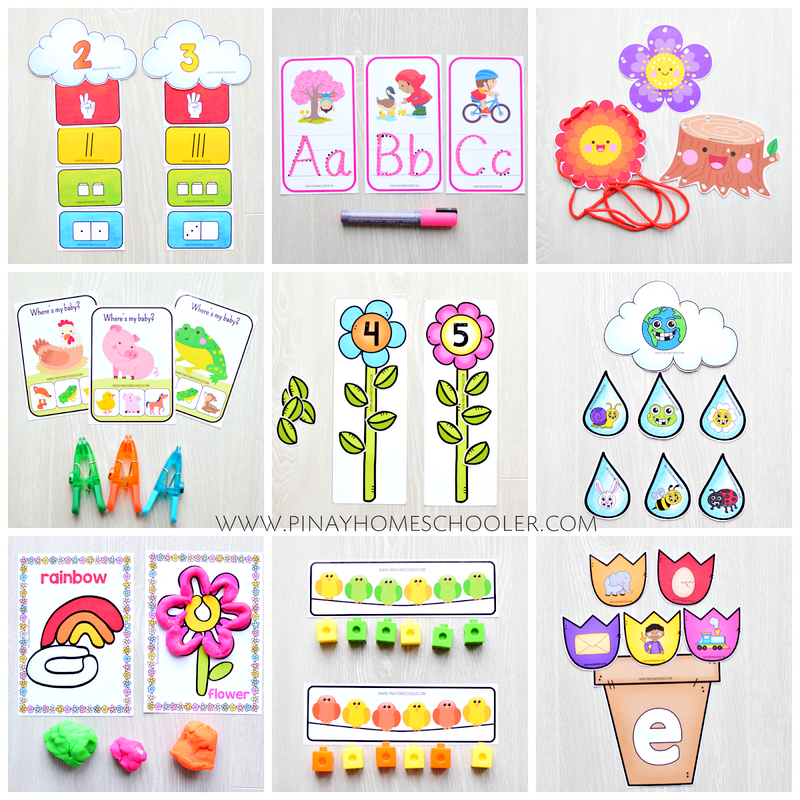 For more details and preview of the Spring Preschool Pack, visit Pinay Homeschooler Shop. I hope that you and your students will like the learning activities of this preschool unit. Happy Learning during this Springtime! You can also checkout our other popular Preschool Unit Learning Packs below!! !